The majority of Hopper’s nocturnes depict New York City. 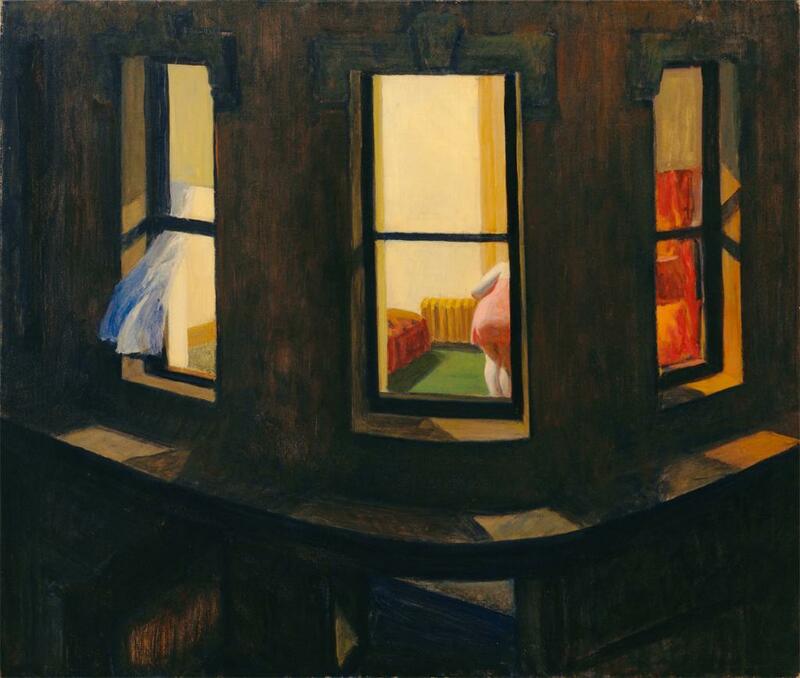 In Night Windows he created a view through a window into a neighboring apartment, which suggests a scene on an illuminated stage watched by an audience in a darkened theater. The woman in her pink chemise stoops in a rather inelegant pose, unaware that she is being observed — a theme appropriated from Degas, an artist Hopper admired. A breeze blows a curtain through the window on the left. A contemporary critic explained the appeal of the painting: “It is one of those glimpses into other lives which one suddenly catches from the window of a passing El, and it crystallizes superbly that momentary sense of the mystery and intensity of the thousands of lives pressing close to each other, all oblivious to the revelations of undrawn blinds, which spell New York more than the soaring spires of skyscrapers. IN-CAMERA 4: Max Forsythe. | STUFF FROM THE LOFT.